It’s hard to find any humor in Venezuela’s political crisis — but not impossible. The Venezuelan government is known to apply pressure against private media that are critical of President Nicolás Maduro and his administration. However, there are two very popular, often critical outlets that have largely avoided its grasp: Reporte Semanal and El Chigüire Bipolar. By their creators’ own descriptions, they are satirical news outlets that take themselves seriously. El Chigüire Bipolar posts absurdly fake stories that resemble actual news. 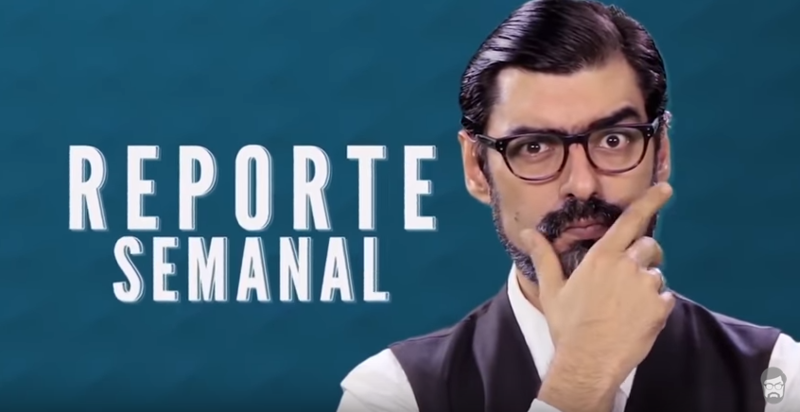 El Reporte Semanal is real news delivered in exaggerated ways by the charismatic Profesor Briceño. Americans can think of them as Venezuela’s versions of The Onion and The Daily Show, respectively. The projects are the brainchilds of the minds at Plop Contenido, a media collective founded by Oswaldo Graziani and Juan Andrés Ravell. Graziani, Ravell and Elio Casale first met working for a television channel in Caracas. Sharing an interest in political humor and writing comedy in their spare time, the three founded El Chigüire Bipolar in 2008. 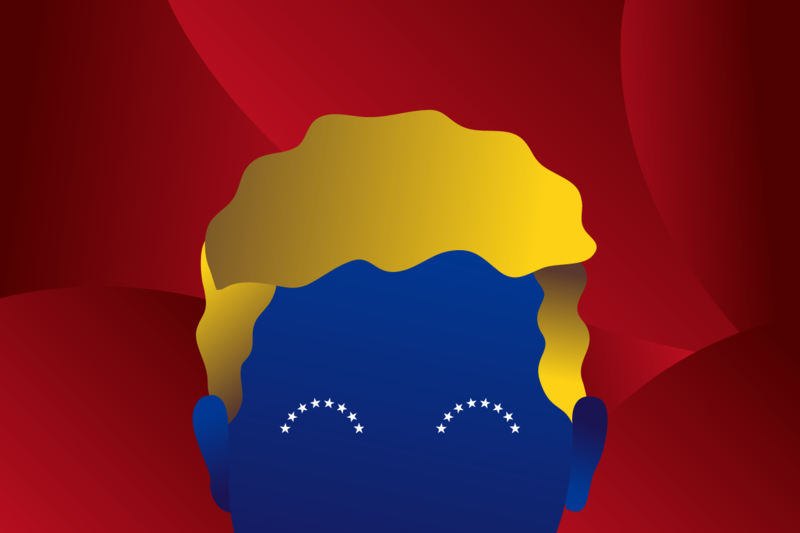 Later they teamed up with VivoPlay — a subscription-based television platform — to start Reporte Semanal, with the idea of creating a show like Last Week Tonight or The Colbert Report, but written for a Venezuelan audience. They approached José Rafael Briceño, a friend and well-known comic, to host the show. The show began in 2014, one year after the death of former president Hugo Chávez and at the start of Venezuela’s economic crisis. Today, the country is embroiled in a grave socioeconomic emergency. Parts of the country see daily demonstrations during which protesters and members of the news media covering demonstrations are repeatedly targeted by state security forces, colectivos and others. Both national and international individuals and entities fear for the democratic future of the country. “This is a country with a government, let’s say, that isn’t known for its sense of humor,” Briceño told the Knight Center. But the work of Plop Contenido definitely resonates with the Venezuelan public. El Chigüire has almost two million followers on Twitter, and its most popular stories — always related to politics — see hundreds of retweets. Briceño has over 300 thousand Twitter followers — more than the show’s subscribers on YouTube, followers on Twitter and likes on Facebook combined. Briceño and Graziani both say they recognize that presenting their content as humor grants them more freedom, but they don’t lose sight of the serious events in which their jokes are rooted. Profesor Briceño, as he is known to fans and the greater Venezuelan public, has been a theater professor, a stage actor and a stand-up comedian. Today, he is the host of the weekly “infotainment” program El Reporte Semanal. Reporte Semanal rounds up the week’s biggest news during an opening newscast, followed by interviews and sketches. Half-hour episodes air once a week on VivoPlay and then popular segments are uploaded to YouTube, where they rack up tens of thousands of views. Briceño emphasized that the program is honest and delivers real news, not a fake newscast. The newscast follows a simple formula: headline and punchline. The show isn’t purely comedy and its host isn’t solely a comedian. Briceño graduated with a degree in journalism from the Universidad Católica Andrés Bello, where he stayed for years as a rhetoric lecturer (hence the “professor” in his stage name) and professional actor with the university’s theater group. “I feel obligated to inform, because I’m trained as a journalist, but the objective of the program is to entertain, and I have to remind myself of that all the time,” Briceño said. Episodes end with an editorial, where Briceño steps out of character to deliver his opinion on the state of the country. As the months have passed, there has been less for the audience to chuckle at during this segment. “Increasingly, the editorial is more serious, it’s a moment where we remind the audience that we are aware of the country we live in,” Briceño said. Ahead of the controversial vote to elect a constituent assembly that could potentially secure unlimited power for Maduro, Briceño ended his show with an impassioned monologue praising demonstrators and denouncing government repression. Briceño might extract humor from the truth, but El Chigüire Bipolar’s popularity comes from stories that are absurdly untrue. “Chigüire” is a uniquely Venezuelan term. The jokes are intended to be understood, most of all, by Venezuelans. 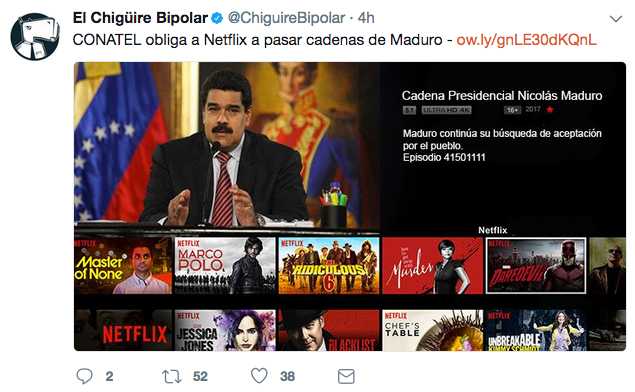 The founders of El Chiguire Bipolar left Venezuela to pursue job opportunities, but the editor and writers of the site still live in Caracas. The site takes on everyone: Maduro, high-ranking Venezuelan officials, the Bolivarian National Police, chavistas, the opposition and the media. “If our job is to point out the absurd, then we have to assume absurdity can be found on both ends of the political spectrum,” Graziani explained. For example, in a story about the Bolivarian National Guard detaining a Canon 5D Mark II camera “for allegedly recording the actions of the security forces,” the writers seemingly point to the high number of arbitrary detentions carried out by state security forces in recent months. By one estimate, more than 4,072 people have been detained during daily protests that began on April 1. According to IPYS Venezuela, there were 29 cases of arbitrary detentions against the press from March to June. In the post “Conatel forces Netflix to stream Maduro’s presidential statements,” the writers take aim at the government agency in charge of regulating telecommunications in the country. Former president Chávez frequently forced radio and television stations to broadcast his public statements, a practice continued by Maduro. El Chigüire Bipolar was one of the winners of the 2017 Václav Havel Prize for Creative Dissent in May. The award is presented by the Human Rights Foundation to celebrate “those who, with bravery and ingenuity, unmask the lie of dictatorship by living in truth,” according to the HRF website. The Venezuelan opposition is entering its fifth month of protests against President Maduro, during which, by some estimates, more than 100 people have been killed. Projects like Chigüire Bipolar and Reporte Semanal find themselves having to satirize increasingly grim realities. They take care to direct the jokes at the appropriate people: those in power. On the other hand, there is the fear that too much exaggeration will minimize the gravity of the government’s transgressions. Graziani maintained that their principle goal is always to make people laugh. He said during the past few months their focus hasn’t changed, but they’re more careful with their material.